Democrat Doug Jones holds a 10-point lead over Republican Roy Moore among likely voters in blood red Alabama according to a Fox News Poll of Alabama voters conducted Thursday through Sunday. Jones receives 50% to Moore’s 40%, with 1-in-10 undecided (8%) or supporting another candidate (2%). Jones’s 10-point edge is outside the poll’s 3 percentage-point margin of sampling error. More Democrats (50%) than Republicans (45%) are “extremely” interested in the election. Republican men (41%) are less likely than GOP women (50%) or Democratic men (53%) to be “extremely” interested in the race. By a 15-point margin, strong moral character is more important to Alabama voters than how the candidate will vote in the Senate (48-33%). Alabama voters believe the allegations against Moore are true by a 6 point margin (39-33 percent). Among Republicans, 13% believe the accusations are true, 60% say they aren’t, and 26% are unsure. Moore is preferred among whites by 20 points (55-35 percent) and whites without a college degree by 33 points (61-28 percent). Support for Moore among white evangelical Christians stands at 65%. 81% of Republicans plan to vote for him. Moore has a 3 point advantage amongst men. 57% of those planning to vote for Moore say they “strongly” support him. Moore supporters who are backing him because they dislike Jones stands at 13%. 29% of Moore’s supporters say they have reservations about their candidate. Moore is preferred among those prioritizing how the candidate will vote in the senate by a narrower 54-38%. Among just the 46% of Alabama voters who are “extremely” interested in the race, Doug Jones’ lead widens to 53-40%. He’s the choice of nonwhites by 76 points (83%-7%), by 31 points among voters under age 45 (59%-28%), and by 20 among women (54%-34%). That jumps to 46 points among women under age 45 (67%-21%). 90% of Democrats plan to vote for Jones. The subgroup of independents breaks for Jones by 29 points. Alabama voters who were interviewed on cellphones are +30 for Jones, while the race is roughly even among all others. Among Doug Jones supporters, 70% “strongly” back him. 13% of his supporters have reservations about him. For those who say moral character is more important, Jones tops Moore by 60-30 percent. Personally, I would love Moore to win as a Democrat. I want to paint the entire Republican Party with him, and it’s very easy to do seeing that he’s supported by the President and the RNC. While winning an additional Senate seat would be great now, winning the Senate in 2018 would be better, and painting the entire party as believing what Moore does makes that task easier. 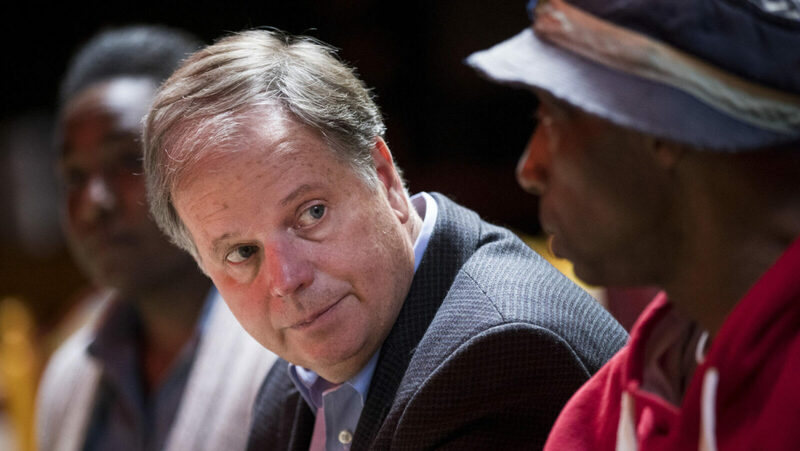 Forget the pederasty that Moore is alleged to have engaged in, or the alleged banning from malls and high school football games due to him being an open pederast. Roy Moore believes that all amendments after the 10th should be eliminated; that Barack Obama is not a natural born U.S. citizen; homosexual conduct should be illegal; the 9/11 terror attacks happened because America has distanced itself from God; Islam is a false religion; there’s no such thing as evolution; Putin is right and America is the focus of evil in the world; preschool is an attempt to indoctrinate our youth; and my personal favorite, things were better for families during slavery. Tying these beliefs to every single Republican for the 2018 midterms is not just political gold, but a political necessity. Most public surveys in the past week have shown Moore with a lead over Jones. One potential explanation for the difference between the Fox News’ poll and other surveys: Jones leads Moore by 30 points among voters interviewed on cell phones, who tend to be younger, while the race is even among voters interviewed on landlines. Other surveys, some of them automated polls, have not included calls to cell phones.